JBL signed Aaron Judge, the 2017 American League Rookie of the Year, as a brand ambassador. Judge will follow in the footsteps of other Yankees greats, including brand ambassador Mariano Rivera, as he’s welcomed into team JBL. Fans will find Judge and JBL all over New York City this summer. Whether hailing a taxi, riding the subway or catching a game at Yankee Stadium, New Yorkers and visitors to the city can expect content and displays featuring the All-Star slugger. 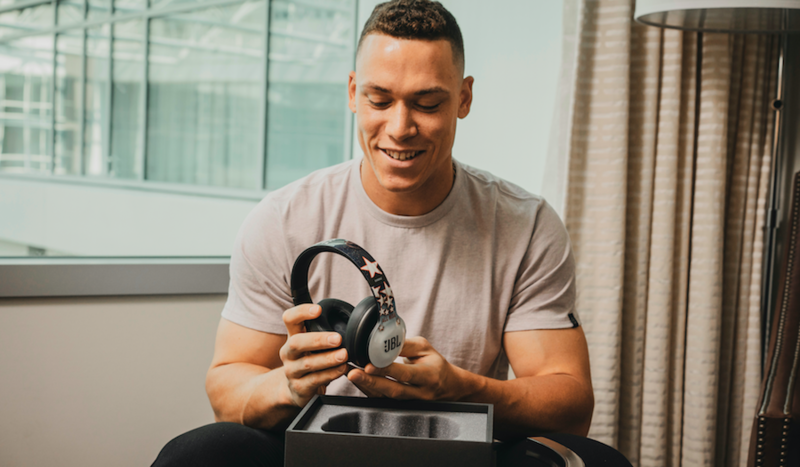 To officially celebrate the start of the partnership, JBL designed commemorative Aaron Judge custom headphones. Judge joins a stacked roster of today’s most popular performers, athletes and entertainers serving as JBL brand ambassadors. JBL’s ambassadors include three-time NBA champion and two-time Most Valuable Player Stephen Curry; three-time NBA All-Star and musician Damian Lillard; soccer star Jerome Boateng; Grammy nominated and multi-platinum selling recording artist Demi Lovato; multi-award-winning singer and songwriter Tinie Tempah; world-renowned musician, producer and humanitarian Quincy Jones; Indian composer and singer A.R. Rahman and actress and humanitarian Priyanka Chopra, among others.